John Logie Baird is remembered by some as the 'Father of Television' and by others as merely one of a number of independent inventors of the technology. Neither view appears completely accurate but there is no doubt that it was 'JLB' who brought the idea of television to the attention of the world. Baird was born in Helensburgh, Scotland, on August 13, 1888, the fourth, and youngest, child of the Reverend John Baird . By the age of 13, he had experimented with remote-controlled photography, converted the house to electric light and constructed a small telephone exchange that connected several neighbours. In 1906 he went to study Electrical Engineering at Glasgow and West of Scotland Technical College. Because of chronic ill-health related to thyroid problems, he was not accepted for military service when war came in 1914. He tried his hands at different businesses, including the 'Baird Undersock' and jam-making in Trinidad, but returned to Britain, initially to Folkestone and then, by late 1922, Hastings, where many early experiments into 'seeing by wireless' - television - were carried out. At the heart of Baird 's system was a rotating disc containing spirals of holes (or lenses) through which a beam of light passed to scan the object. The poor quality of photocells limited Baird 's early equipment to sending shadows and outlines. He was able to apply for a patent on July 26, 1923, but although the BBC expressed interest, they would not participate in his work. Following a workshop explosion in the autumn of 1924, Baird was forced to leave his workshop in Hastings and move to London. Over the following year or so, Baird improved the quality of his equipment until around October 1925 he was able to transmit the 30-line image of a ventriloquist's dummy named Stooky Bill across the room, and then the first image of a human being (the face of office boy William Taynton ) sent by television. A company, Television Limited , was formed, and on 26 January, 1926, Baird demonstrated the system in public, gathering vocal press support and exciting interest in television. In 1928 he succeeded in sending images across the Atlantic. Baird made test transmissions, but the way forward was to broadcast a television service to the public, and the only way of doing that in Britain at the time was via the fledgling BBC , headed by John Reith . Reith was not in favour of television, but following unceasing lobbying of the Postmaster General, from 30 September 1929 Baird broadcast tests on the 2LO transmitter from his studio facility at Savoy Hill, outside normal broadcasting hours. Baird also sold 'Televisor' sets to receive the broadcasts. There were notable firsts, including a performance of Pirandello 's play, The Man with a Flower in His Mouth - the first play to be performed on television in Britain, on 14 July 1930. The first outside broadcast followed; the Derby was televised live in June 1931 and again the following year. Finally the BBC began to take television seriously, and on 22 August 1932, the BBC began a regular television service from basement studio BB in the new Broadcasting House using Baird 's system, albeit still experimental and still low-definition 30-line. Meanwhile, Baird had married Margaret Albu in 1931. But things were not looking good at Baird Television Limited . In severe financial difficulties, control of the company passed to a subsidiary of the Gaumont-British Film Corporation . A year later, in a mid-1933 boardroom coup, Baird was relieved of his duties on the BTL board, although he retained the nominal title of Managing Director. He was effectively banished to his new house in Sydenham, South London, with access to some Company facilities and his own extensive laboratory. Baird Television Limited moved from Long Acre to the Crystal Palace in July 1933. VHF aerials at the top of the south tower, 680 feet above sea level and in sight of seven counties, were installed to transmit high-resolution pictures. BTL leased 40,000 square feet under the south transept, installing offices, three extremely well equipped studios and laboratories, and transmitters. Baird 's subsidiary in Germany developed the Intermediate Film Technique for 'almost-live' transmission, using a cine camera and 17.5 mm film, developed in just under a minute and scanned with a rotating disc. On September 12, 1933, Baird demonstrated 120-line, 25 frames-per-second telecine equipment at the British Association 's annual meeting, and later that month 120-line test transmissions were made from Crystal Palace. On March 12, 1934, 180-line transmissions were shown on a receiver with no moving parts, employing a 12-inch cathode ray tube. In 1934, the decision was taken to appoint a committee to advise the Postmaster General on matters concerning television. Following Parliamentary assent, this was to become the Television Committee that would be headed by Lord Selsdon : its first meeting was held on 29 May. Meanwhile, the Baird Company announced that it would approach the GPO for a licence to begin an independent, high definition television service. Baird director Major Church noted, "...we are technically ready to provide a programme of 180-line television from our station at the Crystal Palace, to serve the whole of the Greater London area." The Television Committee issued its report in late January 1935, proposing a high-definition VHF television service to be operated alternately by BTL and Marconi-EMI , and along with other political considerations, it is certainly possible that Baird was included at least partially to help discourage the company from carrying out its apparent threat to go independent. The BBC 's high definition Television Service from Alexandra Palace in North London was launched officially on 2 November 1936. But then, on the evening of Monday, 30 November 1936, fire broke out in the Crystal Palace main building and spread rapidly to engulf the majority of the site, including the Baird facility. To add insult to devastation, on 16 December the Television Advisory Committee meeting decided to abandon the use of the Baird system in transmissions from Alexandra Palace, and use the Marconi-EMI system alone. Work did not stop, however. The Baird Company went on to install experimental Intermediate Film transmission systems in military aircraft, along with developing large-screen TV, and colour television transmissions were made from the South Tower. There were tests of a scheme to use 600-line television to broadcast newsreels to Gaumont cinemas around the country. Baird demonstrated sequential-frame colour television, first to the press in early December 1937 and then to the public on 4 February 1938 at the Dominion Theatre in London's Tottenham Court Road, where images from Crystal Palace were shown on a 12ft x 9ft screen. With the advent of war in September 1939, Gaumont British closed down BTL. Baird's contract was terminated and his work continued largely unaided until his death. But in 1941 he refined the mechanical system to transmit colour stereoscopic TV images using revolving shutters and Red/Green/Blue sectored discs. Then, finally, there was the ingenious all-electronic 'Telechrome' colour TV system, for which a receiver was first demonstrated to the press on 16 August 1944. 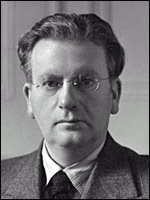 However, despite the undoubted brilliance of both the colour and stereoscopic television systems, they were never implemented commercially, and John Logie Baird died before his time at the age of 57, on June 14, 1946.